You can’t possibly learn all there is to know about computer programming by taking one class. There are so many different programming languages, a ton of vocabulary to learn in order to even understand what you’re learning, and a lot of theory behind computer science and computer programming. How can you possibly know where to begin? The answer is that where to begin depends on how you like to learn. If you want to learn the theory first and start programming later, great! If you prefer to dive in right away and learn theory later, that works too. You can start by learning Python, Scratch, or another language depending on your preferences. You can start by learning no particular language at all and just getting a firm foundation in what programming is. The great thing about computer programming basics is that no matter where you start, you’ll end up at the same place: knowing how to program. If you use any kind of modern technology, you’re using something that was made possible with programming. Key fobs to unlock cars, smartphones, and apps to talk with your friends are all made using different types of programming. There is an increasing number of jobs available that have programming at least as a minor part of the job description. Knowing how to program opens you up to a whole new world of career possibilities and even if you don’t want to get a job involving programming, it can still be useful and even fun in your day to day life. Learning how to code can help boost your problem-solving and creative skills. To program something like an app, you have to work through how to start creating the app in a structured way before you even start writing the code. Learning how to solve problems by breaking the problem down and going through a series of steps in order to solve it is a great skill to have that you can use in your life outside of programming. This is just one way that learning how to program can help you, outside of actually getting a job in programming. There are many different ways you can study computer programming. Studying online is one option and it makes a lot of sense! You’ll need to be on a computer to get hands-on practice regardless of whether you take a computer programming course at a university or on an online website. Studying online opens you up to more options than you can get at your local college and you will also be able to speak with a wider variety of other students than you would be able to in a class with only a couple dozen people. One online option you have is Udemy. Udemy has course offerings in nearly any subject you can think of, including computer programming. What makes Udemy unique is that they are focused on providing accessible, affordable learning to anyone, anywhere. They realize that not everyone is able to attend an expensive university and that sometimes not having access to a course is the only thing stopping somebody from learning the skills they need. By offering hundreds of thousands of courses from thousands of different professors, Udemy is able to provide a course that will work for anybody. How does Udemy work? It’s simple. You sign up for a free account and once you have that, you can begin searching for the courses you want and registering for them. There are no deadlines and you won’t feel the pressure of having to finish a course before you lose access to it because once you register and pay for a course, you have lifetime access to it. This makes it easy to not only learn at your own pace but to go back to the material at a later time if you need a refresher. You aren’t confined to one subject, either. You can take any of the classes available on Udemy whenever you want. Do you already know a little about computer programming? You’re free to sign up for a more advanced class or another beginners class that focuses on different topics and you don’t need to worry about taking prerequisite classes or passing a test before you’re able to sign up for the class you want. Udemy has a wide variety of courses available on computer programming basics, as well as more advanced courses. Whether you’re looking for a hands-on programming class where you can begin to make programs immediately or you just want to dip your toe into programming theory, you can find a class to suit your needs. One such class is Computer Science 101: Master the Theory Behind Programming. This course is designed to teach you all about computer science and programming theory, as well as the basics of algorithm analysis. The course content includes 8.5 hours of video and 18 different articles for you to read. You will be introduced to the binary number system, arrays, how to analyze and sort different algorithms, queues, and more. If it’s been a while since you’ve taken a math class, you’ll also get some refreshers on things like algebraic expressions. This class, as the name implies, is less about hands-on creation of applications and more about the theory behind programming, so if you want a good understanding of how programming works before diving into programming yourself, this is a good class to take. If you want to get started with practicing programming for yourself, take Scratch Academy: Entry Level Computer Programming. You’ll get a free copy of the program Scratch, which you’ll use to create puzzles, games, animations, and more as you go through the course. There are only 1.5 hours of lecture videos since this course is focused on using Scratch and not on learning theory. This course is designed to make learning how to program fun and simple. By the end of the course, you’ll have skills like creating scripts. This course is a good lead-in to learning more advanced programming languages later. Another good course for the basics of computer programming is Head Start to Computer Programming. You will learn theory and vocabulary in this course and you’ll also use Scratch to get some hands-on experience along the way. You will learn about flowcharts, algorithms, Boolean logic, variables and constants, and the components of a computer system. After going through the 3.5 hours of lecture videos and answering questions at the end of the first four units, you’ll install Scratch and go through a few different hands-on activities designed to help you utilize the knowledge you’ve gained. Some students may be more “technology challenged” than others and starting straight out with programming may be too much. Computer Science 101: Computers & Programming for Beginners starts by giving you an understanding of how computers work. You’ll get a firm understanding of what computers are, how to communicate with computers, and what you can and cannot use a computer for. This course also teaches you why computer programming is so important to modern life. After you’ve got that down, you’ll jump into some basic programming theory. You’ll learn different programming paradigms and go through fundamental programming vocabulary, A-Z. There are 20 articles and 1.5 hours of video to go through so this is a good course for anyone who prefers to learn through reading as opposed to lectures. Want to start your introduction to programming by learning a specific programming language right from the start? Computer Programming for Beginners: Learn Python Programming is a great option for you. You will install Python and start learning the fundamentals of how to use it right away. Python is a great language for beginners to learn and once you have a good foundation in it, you can move on to learning more advanced languages. This course has a good mix of lectures, theory, and hands-on activities. You’ll be able to watch 8.5 hours of video and the course also comes with 28 different downloadable resources. You’ll learn different functions in Python, get an intro to “if” statements, and learn how to create different kinds of loops. By the end of the class, you’ll know enough about Python to be able to move onto more advanced Python courses or learn another programming language. As you can see, there are many different ways you can start learning about computer programming. Some people want to get a firm foundation in theory before they start learning a language and others want to dive right in and start programming from day one. You may even want a little bit of both. However you like to learn, you’ll be able to find a course that fits your learning style on Udemy. 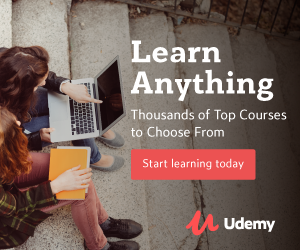 With Udemy, you can even take multiple courses at once without breaking the bank. You won’t be able to do that at a traditional university. In the end, whether you start with theory or hands-on learning, you’ll be able to learn new skills and advance your career (or get into a new one). Programming is an increasingly important skill, so why not start learning it today?